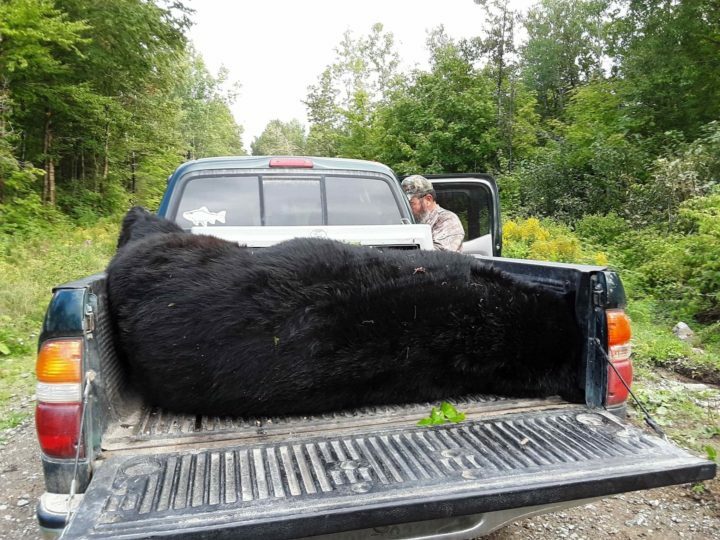 Pat Saling of Ohio shot this 552-pound black bear while hunting out of Tylor Kelly's Camps in Allagash. Saling was hunting with houndsman Mike Hubbard. 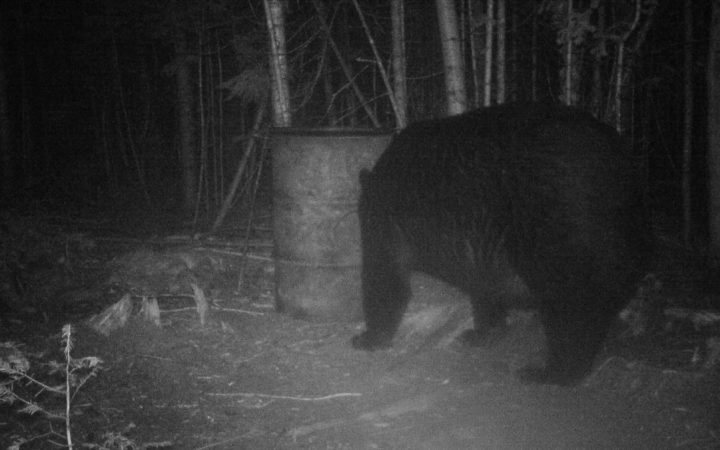 Guides have been seeing the bear on trail camera photos for years, and had taken to calling it "Barrel Crusher." It was the largest bear taken by hunters at Tylor Kelly Camps in 35 years of bear hunts. BANGOR, Maine — Earlier this year, wildlife biologist Randy Cross predicted that a relative lack of natural foods would make bears more eager to approach baited stands come bear season, and that equation could result in an advantage for the hunters. With less than two weeks left in the state’s season for hunting bears over bait, that appears to have been the case, Cross said. About 3,000 bears are typically shot by hunters each year, and as of Wednesday, that number sat at 2,157. And the hunt started out with a bang: Youth Bear Day hunters tagged 63 bears on Aug. 25, compared with the 23 taken by junior hunters on their special day a year ago. 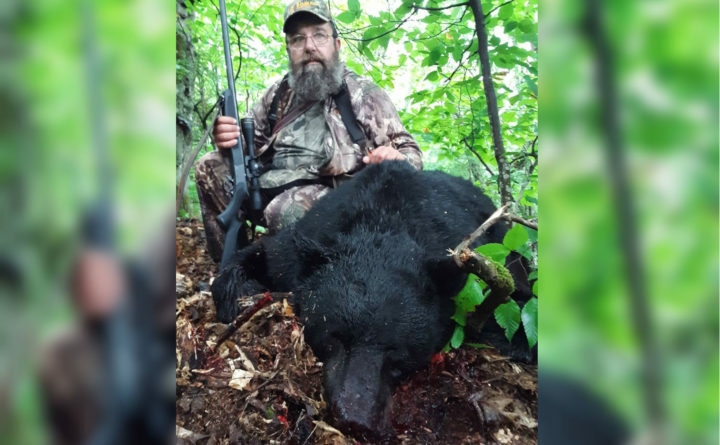 Pat Saling of Ohio shot this 552-pound black bear while hunting out of Tylor Kelly's Camps in Allagash. Saling was hunting with houndsman Mike Hubbard. Up in Allagash, the folks at Tylor Kelly’s Camps will vouch for Cross’ assessment on the bears’ eagerness to raid bait sites. Sue Underhill Kelly said bears have been consistently hitting baits since the beginning of the season, and on Wednesday morning, one of the outfitter’s hunters bagged the largest bear in its 35-year history. The bear — nicknamed “Barrel Crusher” — weighed 552 pounds, live weight, and was shot by hunter Pat Saling of Ohio. Saling was working with houndsman Mike Hubbard and Hubbard’s dogs when he bagged the massive bear. Maine’s bear season over bait runs from Aug. 27 until Sept. 22 this year. Hunting with dogs is allowed from Sept. 10 through Oct. 26, and trapping season for bears stretches from Sept. 1 to Oct. 31. The general hunting season for bears (without using bait or dogs) runs from Aug. 27 to Nov. 24. Cross said the bulk of bears shot each year — about 75 percent of the total — are taken by those hunting over bait. This bear, nicknamed "Barrel Crusher" was shot by a hunter working out of Tylor Kelly's Camps in Allagash on Wednesday. The bear weighed 552 pounds, and had been photographed several times on trail cameras in recent years. The mechanisms at work are complex, and can sound confusing. It makes sense that bears would seek human-provided food if their own sources of food aren’t available, but it seems to make little sense that the bears hunters are shooting are fatter than they would be during a year with more abundant food. During a year when there’s plenty of food on the landscape, bears process their chow a lot differently, Cross said. That’s what’s happening this year, he said, and that’s why hunters are seeing fat bears with thick, luxurious pelts. Cross said he understands why some people don’t think his explanation makes sense. “It’s terribly hard to wrap your head around. A lot of the things are just so counterintuitive when you’re talking about bears,” Cross said.